Because many users prefer a commercial quality centrifugal juicer, this Nutrifaster N450 Commercial Juicer Review covers both home and professional use. 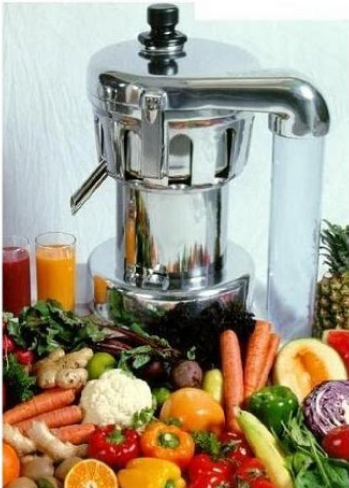 A commercial juicer is typically is much more powerful, often includes higher quality materials such as stainless steel, and will have options that make it more enjoyable to use over lower end models. The downside is the cost of course, so some use a lower end home model until they are convinced of the benefits of juicing and are able to afford a higher end model. The Nutrifaster N450 Commercial Juicer is one example of this. The manufacturer states that it is ideal for juice bars, health clubs, spas, restaurants, and institutions – where a higher volume may be needed, and if you are juicing on a daily basis, this is definitely one to consider. 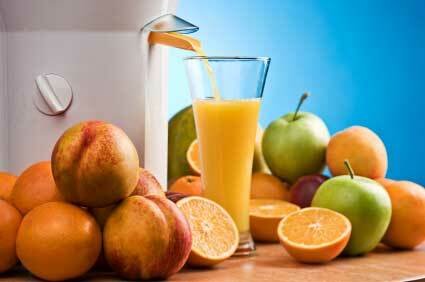 The Nutrifaster N450 Commercial Juicer is a fully-featured juicer with many strong qualities. It is fast, quiet, easy to use, easy to clean (as juicers go), and durable. It is a centrifugal juicer, and works via a fast-spinning blade. Some feel a centrifugal may be a bit less beneficial due to the heat of the blades and the possibility of losing some enzymes and nutrients (over cold-press or masticating juicer types). However, this machine runs at 3450 RPM, which is significantly lower than others, which can run at 10,000 or more, and this slower rate is said to prevent the heat generation and potential loss of nutrients, while also adding the benefit of lower running noise level. It has a high-powered 1.25 horsepower motor, higher than many models, so it is fast. There is a 3-inch plastic pulp tube that can be used, although some users prefer not to use it, using a bucket or larger receptacle in its place. This is a plus so you won’t need to keep stopping to empty the pulp from the basket. The larger feed tube helps save time since you will not need to cut your fruits and vegetables as small to feed into the machine, and it handles these pieces with ease. It is designed to be durable and easy to care for. All juicing parts can be run through the dishwasher or hand washed (blades, juice pan, basket, pusher). The basket will be the most important to keep clean, to allow the most juice through – if the pulp gets dried on, it can be soaked and gently cleaned with steel wool scrub pads. Just like knives, the blade needs to be sharp to do its best work. The manufacturer suggests sharpening the blade every 2-4 months for commercial use; for home use it should stay sharp for much longer. They do offer a blade sharpening service, although a local knife shop or appliance repair shop should be able to do this if needed. There is a safety latch that must be engaged for the machine to work, preventing accidental use or injury. There is also an automatic shut-off to prevent overheating of motor. The location of this is not the best design in terms of quickly resetting, although it is likely designed this way to protect it from liquids – it is on the underside of the machine, inside a cover that has a Phillips-head screw that needs to be loosened. This would not be more than an annoyance for home use (and you may not ever overheat the machine), but I imagine it could be inconvenient in a commercial setting. were just adding it with their other fruits or vegetables which seems more likely. Other reviewers who used the shredder blade for kale, spinach, and other greens, noted that it worked great for them. It is heavy – 61 pounds. It is designed to sit on the counter, so if you are looking for a juicer that you can put in a cupboard after each use, this may not be a practical choice. Warranty period is shorter than other models (this is common for commercial models due to expected higher use). This model includes a 1 year limited warranty. This is a high-end centrifugal juicer that gets good reviews, and is suitable for business or home use. Many users agree that it is fast, quiet, easy to clean, and worth every penny!